Washington High School honored the one Lady Lion senior, Savannah Wallace, prior to the game against Wilmington Saturday, Feb. 4, 2017. Washington freshman Rayana Burns drives between Wilmington defenders Katlyn Jamiel (23) and Jasmine Jamiel during an SCOL game Saturday, Feb. 4, 2017 at Washington High School. On senior night at Washington High School, the Lady Lions welcomed the Lady Hurricane from Wilmington High School. 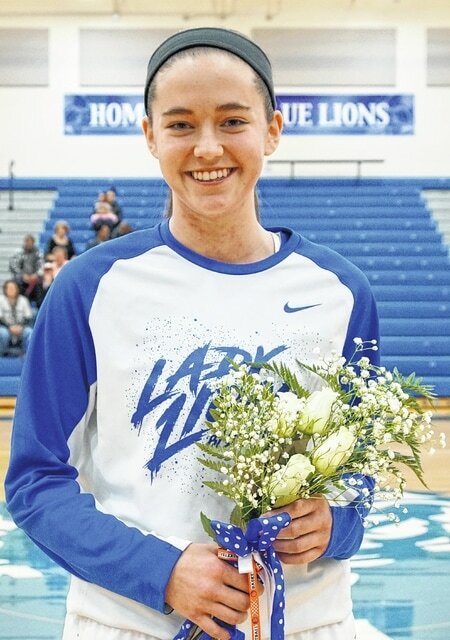 Washington honored its one senior, Savannah Wallace. The Lady Lions took a 10-0 lead at the start, before falling to Wilmington, 50-41. 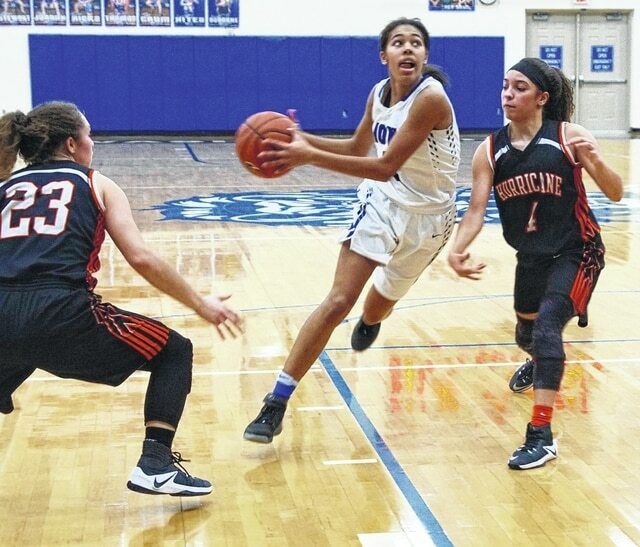 Washington sophomore Hannah Haithcock and Wilmington sophomore Mya Jackson shared game high-scoring honors for their resprective teams, each with 22 points. For Washington, freshman Shawna Conger scored five points, junior Maddy Garrison scored four and sophomore Tabby Woods scored four. Washington led 13-7 at the end of the first quarter. A strong second quarter proved to be the difference as Wilmington outscored Washington 18-10 in that frame to go in front 25-23 at the half. Wilmington took the third quarter, 12-9 to lead 37-31 after three. The Hurricane outscored the Lady Lions, 13-9 in the fourth quarter for the final 50-41 margin. Washington (now 6-7 in the SCOL, 10-10 overall) has a game Tuesday at Circleville. Wilmington is now 10-3 in the SCOL, 15-5 overall. WASHINGTON — Rayana Burns 0-0-0; Maddy Garrison 1-2-4; Bre Taylor 0-0-0; Kassidy Hines 0-0-0; Savannah Wallace 1-1-3; Tabby Woods 0-4-4; Shawna Conger 1 (1)-0-5; Maddy Jenkins 0 (1)-0-3; Hannah Haithcock 9-4-22. TOTALS — 12 (2)-11-41. Free throw shooting: 11 of 15 for 73 percent. Three-point field goals: Conger, Jenkins. WILMINGTON — Jasmine Jamiel 0-0-0; Mya Jackson 7 (2)-2-22; Faith Sanderson 1 (2)-3-11; Katlyn Jamiel 0 (3)-2-11; Emily Edingfield 0-2-2; Leah Frisco 2-0-4. TOTALS — 10 (7)-9-50. Free throw shooting: 9 of 20 for 45 percent. Three-point field goals: K. Jamiel, 3; Sanderson, 2; Jackson, 2.